Our blog friend, George, contacted us last week and asked if we wanted to borrow his Madsen for a few days to test it out and share our impressions. We’re always up for trying out new utility bikes, so of course we agreed. 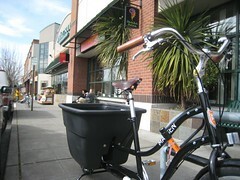 I pedaled over to Ballard yesterday afternoon and picked up the bike. We’ve only had it for 24 hours and are not ready to post a full review. But I thought I’d throw up a few pictures of the first afternoon with the bucket bike. This entry was posted in alternative transportation, bikes, cargo bikes, kids, sustainability and tagged alternative transportation, Bucket Bike, cargo bike, Madsen Cycles, utility cycling. Bookmark the permalink. Cool, cool. We gave a bucket bike away and rode it all over Austin before that. Dig it. Austin’s got a great bike vibe but I wouldn’t have known it if I hadn’t borrowed a bike for your ride. Thanks for the hospitality! Cool! I look forward to reading more and seeing more pictures. Love that black madsen! That sure beats idling your Suburban in the school pickup traffic jam. George has tricked that out a bit, eh? I like the new bar setup … Look forward to hearing how it compares to your xtracycle fleet. great pictures! have fun with the bike. I’m in SoCal for a few days and have been wishing I had the Madsen here for getting around…. Will look forward to hearing more. We’ve got a Madsen, it has been great for hauling up to four of our five kids. We enjoy it. George, I have been looking at alternate bar setups for my bike. What have you done? Are those Albatross bars? The camera angle may be deceiving, they seem to have more rise. Thanks for all the comments. Tim and I are planning a joint review – we’ve both taken it out and loaded it up so we’ll share our impressions soon. George did upgrade the bars, grips and saddle. From the pictures I’ve seen of the stock setup, these changes were essential! I wouldn’t want to ride the bike around town in my “normal” clothes with the stock saddle and bars. Looks really uncomfortable. Looks great! 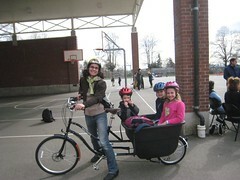 I am saving up for a Madsen, looking to upgrade from walking all over town with a big double stroller and my two boys. Looking forward to the review. I am a real biking newbie and I am concerned about how a couple other reviews mentioned the necessity of upgrading the saddle and handlebars, I don’t really know anything about choosing the appropriate new pieces, so I would love some talk of that in your review. Thanks! In terms of the Madsen’s stock saddle/bars/pedals, it really is just a matter of personal preference. I like the wider Brooks B67 saddle, which I use on some other cargo bikes, so I went with that here. The standard saddle may be preferred by some, it just depends what you’re used to and what you like to ride. Because I went for the more upright riding position, I like the wider saddle. If I were using this bike as a bike messenger, for example, and racing around town a little more, and/or preferred a narrower saddle, the stock one would be just fine. I think Madsen’s designers were wise to spec the bike with the saddle, bars, and pedals they did: they’re good choices, but easily swapped out if someone prefers. The stock saddle will not make a more upright rider happy, but since saddle preference is so individual, I don’t mind that they spec’d a cheap seat. I hear the Velo Orange Model 8 compares well with a Brooks B67 (also my favorite saddle), but cheaper, if money is tight.